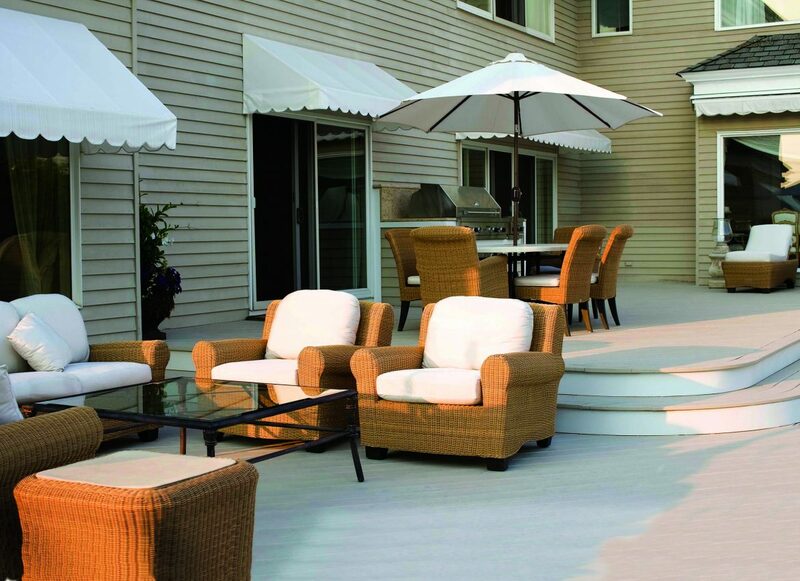 Let’s face it, ugly decks, patios, roof decks, etc., are not very enticing – so why not consider doing an “ultimate makeover” with vinyl membrane? This project is relatively quickly, easy, affordable, and will leave you with a vinyl deck or patio that you’ll actually want to use. So why is a vinyl membrane such a good choice for a deck makeover? Installing a vinyl membrane over an existing deck is easier than you think. For one, you don’t need to tear out an existing deck or patio surface, since you’re just covering it. Once the surface is prepared the new vinyl decking gets rolled over the top, secured, and sealed. Finito! No waiting for stains or sealers to dry, and the installation can be done in many types of weather (as long as you can shelter the deck from rain, if it occurs). You could have a brand new space in just a few hours with a Tufdek deck makeover, imagine! You know when you have rooms in your house painted and they instantly look ten times better! A vinyl membrane is like that. Since it covers the whole surface, it looks like you have a brand-new deck with a Tufdek deck makeover without the hassle of tearing it out and building a new one. Much like how a new roof will keep your home cozy and dry, having a new installation of vinyl decking will likewise keep your deck, patio, and the associated space below and adjacent dry. This might not seem like much, but anytime you increase the waterproofing of your home you’re helping it last longer. If your patio or deck is feeling a bit cramped, this is the perfect time to add an addition. Rather than worrying about everything matching up, you just build it out and cover everything with the same vinyl membrane. When completed, all of it will look the same. Any major or minor issues with decks and patios can (and should) be fixed prior to the installation of a new vinyl membrane. Some examples include rotting or loose boards, improper drainage, slope, etc. Small fixes can be made, rather than tearing out or starting again, and then covered with new Tufdek vinyl decking. For example, if you had a wood deck that needed boards replacing, you’d have to install new boards, then sand and stain the entire deck so it matched. That’s a huge job! Besides never having to sand and stain again, with a vinyl membrane you’d just need to install new boards and then have the vinyl decking installed over the surface. Make this the year you restore your ugly deck or patio with a Tufdek deck makeover, check out some beautiful vinyl deck surfaces in our gallery and start planning!